• Green chillies (chopped) - 2 number. • Cucumber (chopped) - 1 number. • Tamarind - 1 tablespoon. • Garlic cloves - 4 number. • Oil - half tea spoon. • Mustard seeds - pinch. • Curry leaves - 1 spring. • Urad dal - 1 tea spoon. • Red chilli dry - 2 number. Peel the cucumber remove the seeds and cut into pieces.add to blender cucumber pieces,green chillies, cumin seeds, garlic, tamarind, salt and blend to a coarse paste and transfer in to a bowl. For tempering add oil, mustard seed, red chilli, urad dal, curry leaves once urad dal is light brown remove and add to the cucumber mixture. serve with hot rice or naan. Dosakaya Pachadi is an easy to make Indian food recipe. A traditional Andhra pachadi. wow that cucumber almost looks like honeydew melon. and thats the cutest pan ever! The chutney looks delicious. 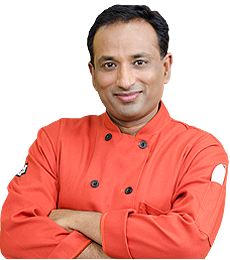 @tabellariae Chef says, "Namaste, Salaam Valaikum and Sath Srikaal ". These phrases are forms of greeting used by Hindus, Muslims and Sikhs respectively. too bad you can't eat the skin. it's so pretty. Chef we need more such chutneys from you. Could you teach us how to make Peanut chutney and green tomato chutney? what is HING ? he mentioned it before but I do not know! and I do not know where to find this!